This patient is a 33 year old mother from Virginia Beach. Since having children, she is bothered by the sag of her breasts and would also like to be larger. During our consultation, I explained that with this degree of heavy breast tissue hanging below the fold of her breast, a vertical breast lift would give her the best improvement. This would be far more dramatic than anything that could be done with skin tightening alone. I feel very strongly that breast tissue cannot be lifted, especially if it has any weight to it, without removing some breast tissue. During her procedure, I removed 192 grams on the right and 116 grams on the left side with 375 cc implants placed at the same time. She opted for saline implants at the same time as they give the advantage of more fullness above. The implants would also make up for the breast tissue that was removed at the time of her breast lift. Due to asymmetry, we decided to remove 192 grams on the right and 116 grams on the left in an attempt to make her more even. 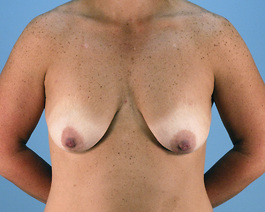 She had 375 cc saline implants placed at the same time as her breast lift. We can see from the photographs that a vertical breast lift is a very powerful procedure from dramatically reducing skin on skin, or completely eliminating it. 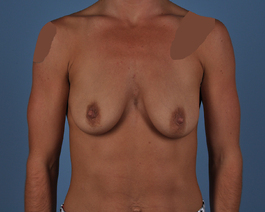 Also, saline implants give an extremely natural appearance, especially in a patient who already has a fair amount of breast tissue.In this example we have follow-up photos taken three years after her surgery.This type of lift is it not only more dramatic, but clearly lasts longer than older techniques in the same patients that tend to bottom out or sag again over time. These results demonstrate the superior scars and powerful, long term lift of a vertical mastopexy over implants.